Parlor games are games that are played in player-built taverns or in-node taverns. They will vary based on the racial influences of a node. Some will be dice games, others will be card games; and some will be less savory. These games will involve aspects of both chance and skill. They must be played between 2 or more people. 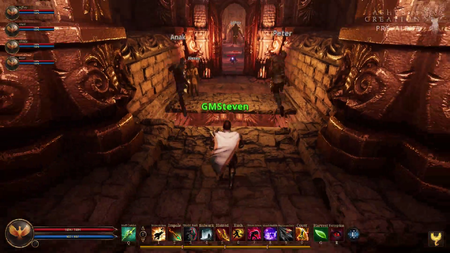 Players will be able to wager in-game currency against other players. 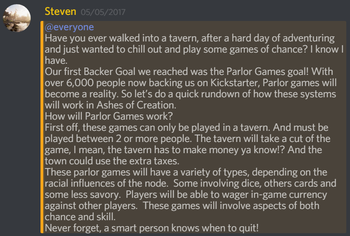 A portion of the income from the game goes to the tavern owner or node. Parlor games may reflect the predominant race of a node. Parlor games were a Kickstarter stretch goal. There may be a mobile application that allows players to interact with parlor games (tavern games). ↑ Livestream, 24 May 2017 (11:04). ↑ Livestream, 17 November 2017 (11:53). ↑ 6.0 6.1 Livestream, 9 February 2018 (10:42). This page's content was last modified on 30 October 2018, at 23:40.